Chicken makes a regular appearance on my weekly meal plan. My family loves it and I enjoy working with it making delicious recipes for them to try. You can expect lots more yummy chicken recipes on this blog this year as well! 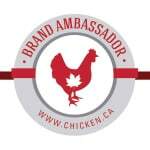 I’m excited to announce that I’m a Brand Ambassador for the Chicken Farmers of Canada for 2017. This will be my fourth year participating! Wow, time sure flies. Free Range: Chickens must have access to the outdoors. Free Run: Chickens must be able to move freely in the barn. All Canadian chicken is considered free run. Grain Fed: All Canadian chicken is given a feed that consists of over 88% grain. This is a term mostly used for marketing. Halal: A term used in Islamic law. Chickens must be well-rested and handled in a way that minimizes suffering. Hormone Free and/or Steroid Free: Mostly used as a marketing term since using hormones in raising chickens has been banned in Canada since the 1960s. Kosher: The chicken is processed according to kosher dietary requirements for Jewish law. Organic: The chicken is raised to meet a specific standard to meet the requirements set by the Canadian General Standard Boards and provincial organic certification boards. Raised without Antibiotics: Chickens were not treated in any way with antibiotics. Vegetarian Grain Fed: Chickens are fed with a feed that contains no animal by-products and only vegetable sources of protein (like soy) are used. When you are out doing your grocery shopping, look for the Raised by a Canadian Farmer logo on the chicken you buy. It lets you know that the chicken you’re buying for your family is Canadian. In addition, you’ll know that it raised according to the highest possible quality standards of food safety and animal care. If you don’t see the logo on the chicken at your store, you can voice your opinion to the store and let them know you want it. Over 80% of Canadians want this mark on their chicken so let’s make our voices heard! Now that I’ve given you a little background about the Chicken Farmers of Canada, let’s get on to this month’s recipe! I was tasked with creating a healthy chicken recipe. I know many of us have made New Year’s resolutions to eat better – me included. 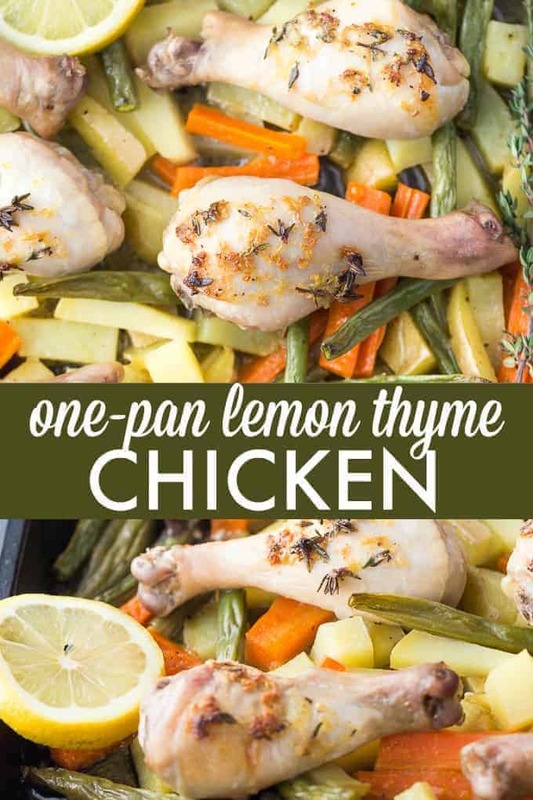 I made an easy sheet pan recipe: One-Pan Lemon Thyme Chicken. It’s SO GOOD! I love that everything cooks together on one baking sheet. There’s less mess to deal with after dinner. I roasted green beans, carrots and potatoes with chicken drumsticks rubbed with a flavourful buttery herb coating. It’s a perfect meal for those following a low carb diet. I love that the lemon butter herb spread also makes it way on to the veggies and adds even more flavour. Even the veggie haters in my house liked the tender roasted veggies. The best part is the chicken drumsticks, in my opinion. They were perfectly cooked and had just the right hint of lemon/herbs. I cooked ours with the skin on, but you can always remove it after baking it. 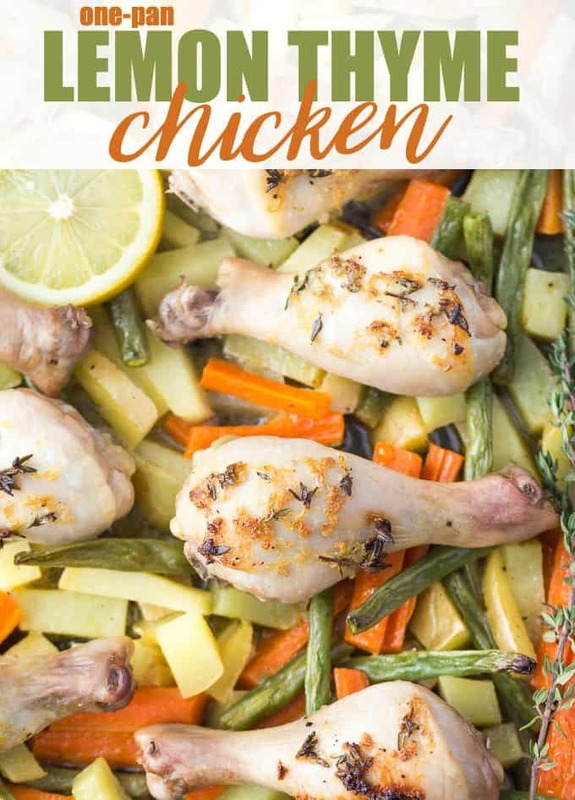 This recipe is a wonderful family meal when you want to get a healthy, filling dinner on the table quickly! The Chicken Farmers of Canada also has many awesome chicken recipes. Use the handy search function to find recipes to try via category or dietary need. 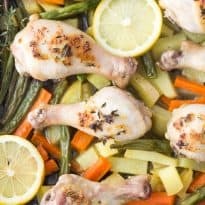 What is your favourite healthy chicken recipe? I’m always looking for new ones to try! You might also like this Sticky Chicken or Green Bean Casserole. 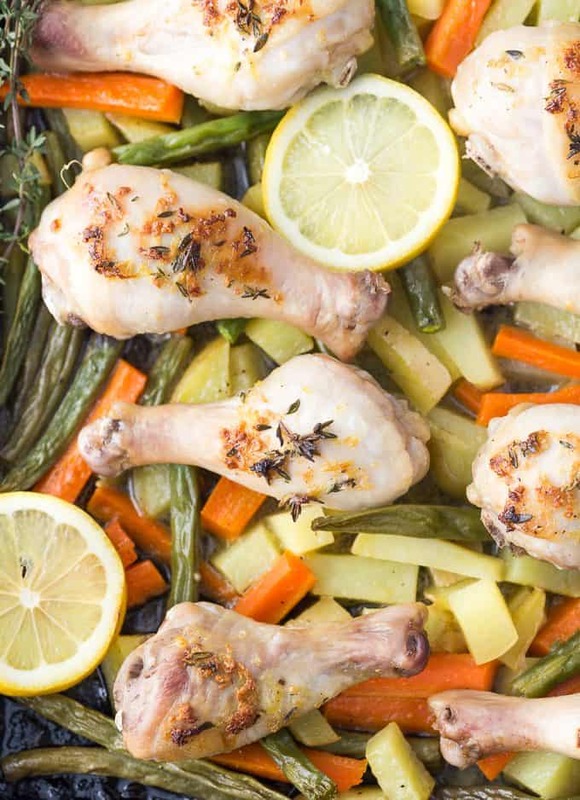 Tender, flavourful chicken drumsticks covered in a lemon/herb butter spread are roasted to perfection along with carrots, potatoes and green beans on one pan! You’ll love how easy it is to make and clean. In a large bowl, add the potatoes, carrots and green beans with olive oil, salt and pepper. Toss to combine. Spread on to a baking sheet in a single layer. In a small bowl, mix together the butter, thyme, lemon zest, garlic, salt and pepper. 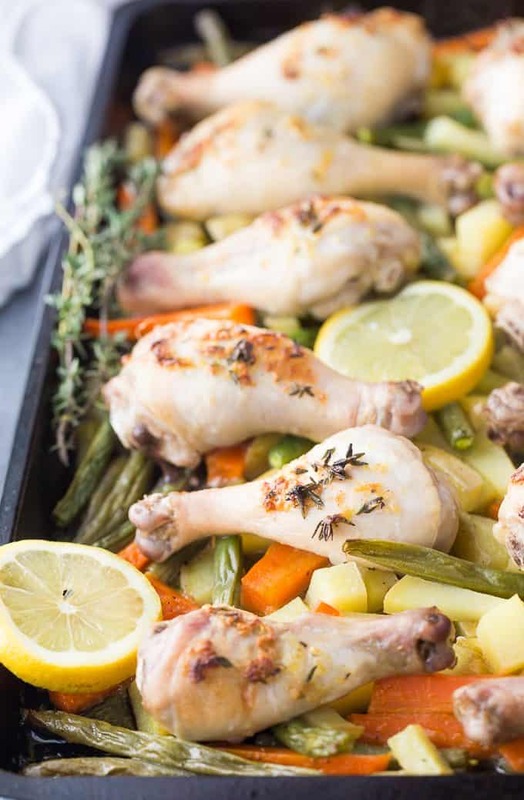 Rub the butter mixture on the chicken drumsticks and place on top of the veggies. In another small bowl, stir together lemon juice and chicken stock. Pour evenly on to the baking sheet. Bake for 25 minutes or until chicken has reached 165F on a meat thermometer. Serve hot.